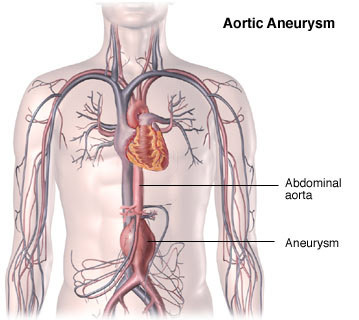 What makes an aortic aneurysm patient “inoperable”? How can we improve on our surgical solutions to save the life of a high risk or “inoperable” aneurysm patient? Well, first let me give you a quick, down-to-earth introduction to the technical aspects involved in an aortic aneurysm repair operation. Once you know what the basic technical challenges are, you will appreciate the solutions we have developed in high risk heart surgery cases. These new technologies have made the difference for so many heart patients that were otherwise hopeless and inoperable. 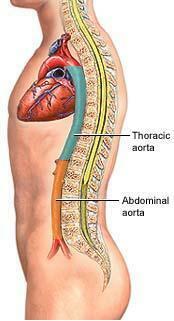 Aorta is the main pipeline in the human body. The heart pumps oxygenated blood in it with every heartbeat. The blood then flows to every organ in the body through side branches of the aorta. This “pipeline” is roughly 1″ in diameter in most people with a normal aorta. 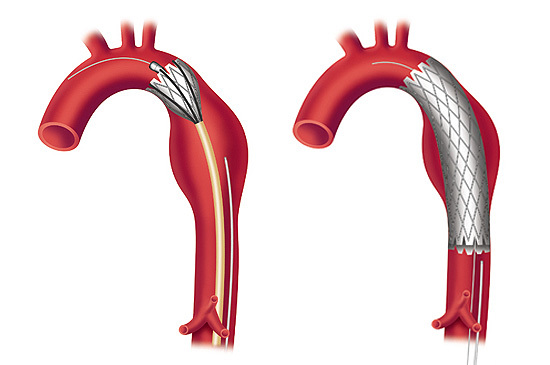 Some patients are affected by a tendency of the aorta to enlarge and balloon out over time. If the diameter of the aorta grows beyond a critical size, it becomes dangerous and life-threatening. The operation to fix this problem might resemble plain and simple plumbing. The portion of our pipeline (the aortic aneurysm) is taken out and replaced by an artificial pipe that recreates a normal size and function and saves our patients from the risk of a blowout or an aortic dissection. Your local doctor might deem your situation inoperable, if any of the steps above cannot be preformed within standard choices available in your area. OK!! Let’s start the list of specific answers to question#1 and question#2. Consider it the troubleshooting chapter of your aneurysm manual. A. “The Aorta is heavily calcified and cannot be used to connect the heart-lung machine or to apply a cross clamp to stop the heart and perform a repair.” The calcification makes the aorta “crunchy” and unusable. If you try to stick a cannula in it or a clamp across it, it will crack and release small crumbs of calcium into the general circulation, causing serious problems. These calcium crumbs can float to any blood vessel and effectively block the blood flow to any organ in the body they travel to. If they go to the brain they’ll cause a stroke, if they go to the kidneys they can cause kidney failure and the list of problems goes on for any organ in the body. The troubleshooting consists in connecting the heart lung machine through a branch of the aorta away from the calcified area. If you are told that you are inoperable for this reason, it might be time to search for a second opinion in a reputable high risk heart surgery center and inquire if you are a suitable candidate for a surgical option. B. “You have bad lungs and/or bad kidneys and/or bad liver!” If a patient has other medical conditions is at increased risk for surgery. Keep in mind, though, that the presence of a significant risk of aneurysm rupture or dissection might still hold surgery as the best option available. The decision to proceed with surgery is based on a careful evaluation of the balance between the risk of surgery on one hand and the survival benefit of repairing the aneurysm before it bursts on the other. Every aneurysm case is different and should be carefully evaluated by a medical professional to see if a technical option is available to help an individual patient. In a specialty center we can often consider less invasive options that can be better tolerated even in the high risk patient. 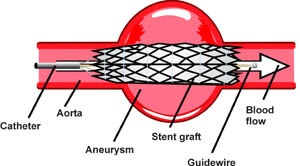 A good example involves the ability to deliver a stent inside the aneurysm by using a catheter instead of a surgical operation. See pictures below to visualize how it is done. C. “The patient, otherwise clear-minded and independent, is considered too old and/or frail to withstand an open heart operation.” Well here is a good question to ask if you are told that this is the reason why you are inoperable: “Dear doctor, am I not too old and frail to survive my severe heart condition and avoid a miserable end of my life?” To put it in the words of many feisty octogenarians: “I might be old but I am not ready to die yet! !” A decision about surgery should not be simply based on age and frailty. You might have a large aneurysm that is diseased enough to carry a 40% or 50% chance of serious or lethal complications if nothing is done about it in a timely fashion. In such a case, avoiding surgery does come with worse consequences. You need to know what your options are. Needless to say, every case is different and you should always discuss your case with an expert medical professional. Expert minimally invasive and high risk heart surgery centers can offer surgical and catheter based options that might make a significant difference in the ease of recovery and quality of life. D. “The heart is too weak.” The strength of the heart is commonly measured as Ejection Fraction (EF). A normal EF is 60-65%. The lower the number, the weaker is the heart. The response to this condition can vary significantly among heart specialists. Some surgeons might not be comfortable operating on weak hearts because they feel they might not recover well after surgery. High risk heart surgery specialists might offer a more secure outcome by meticulously managing certain heart conditions before, during and after surgery. The high risk heart patient can be optimized before surgery with adequate preoperative medical intervention, during surgery with advanced surgery techniques and can then recover postoperatively with expert management of congestive heart failure and low ejection fraction. E. There are also other reasons why your doctor might consider your condition as inoperable. Please feel free to contact us and discuss your questions and concerns with us. If you’ve been diagnosed as a high risk or inoperable aortic aneurysm patient for one of the reasons listed above, it is important that you talk with our expert heart surgeon, Dr. Giovanni Ciuffo, for a second opinion. Contact us online or call (330) 588-4676 to schedule an appointment with Dr. Ciuffo.